Forgot your login? Click here. This fair trade certified organic coffee is velvety, bright, and enticing. You’ll enjoy its mild, nutty character, light acidity and undertones of chocolate. A full-bodied yet smooth favorite of Big Cat Coffees! 96 Count $61.96 $59.96 On Special! Maine, New Hampshire, Vermont, Rhode Island and the Common Wealth of Massachusetts. 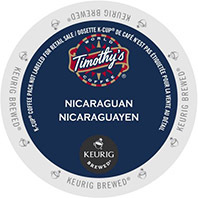 Keurig Home Brewers and K-Cup Packs are available to residential customers from our sister company Big Cat Coffees. For more information on our Residential Services please call 1-877-528-7244 or see our home K-cup Pack brewers for more information.